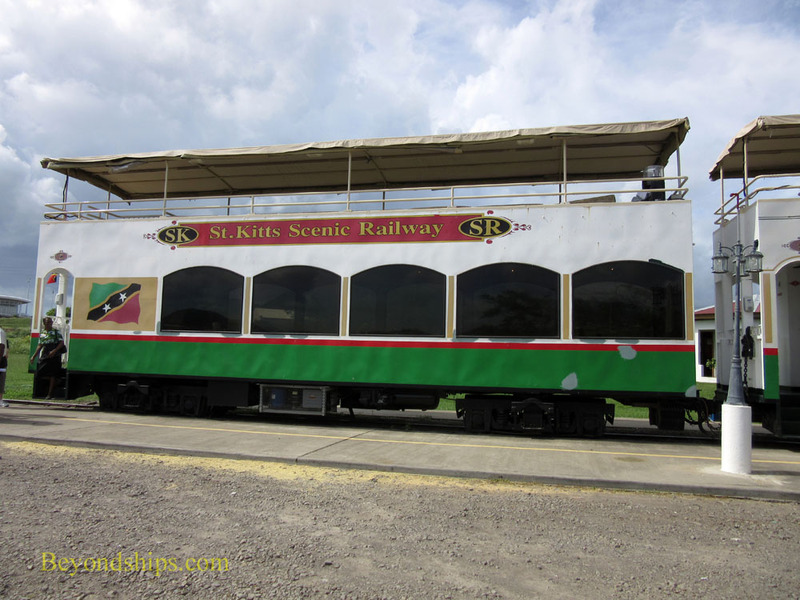 The St. Kitts Scenic Caribbean Railway is perhaps the most popular shore excursion in St. Kitts. You get to see most of the island while experiencing an unusal conveyance. Built in the early 20th century to transport sugar cane from the island's plantations to the sugar factory in Basseterre, the Railway is a narrow gauge railroad. It is some 18 miles long and runs the length of the island. Traveling at about 10 miles an hour, the train journey takes about two hours. 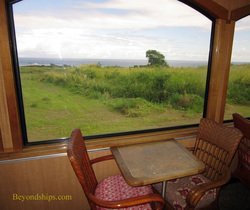 The tracks do not go all the way around St. Kitts but rather along its Atlantic side. A trip takes you from one end of the tracks to the other. Vans take passengers from the cruise ship terminal to whichever terminus the train is at. When the train ride is over, the vans pick you up at the other terminus. All, told the time in the van adds an hour to the excursion. When we took this excursion, the train was at its northern terminus. Therefore, the van drove 12 miles up the Caribbean side of the island. The guide pointed out various landmarks along the way like the vetinary college and the fortress high above on Brimstone Hill. We found the train in a grassy field. Here, there was a loop track that enabled the train to turn around. The train consisted of a small diesel locomotive, a tender and five carriages. Each carriage has two levels. Downstairs is enclosed with wood paneled walls and large picture windows. It is air-conditioned. Upstairs is open-air with a camopy covering the seating area. While the downstairs is arranged in tables and chairs, the seating upstairs consists of a cushioned bench running around the perimeter of the car. If you sit naturally on the upstairs seats, your view is of the interior of the car. As a result, people spend much of their time twisted around so that they can see the passing scenery. Passengers can sit either upstairs or downstairs. In fact, the number of passengers is limited so that during the journey you can move from one section to the other. This requires climbing up and down a narrow spiral staircase. Even though the staff were happy to assist passengers with climbing the stairs, most passengers choose to remain upstairs throughout the journey when we were riding the train. Upstairs at the front of each car is a small bar. Various rum-based drinks and some non-alcoholic beverages are available free of charge. A staff member comes around and takes each passenger's order. She then prepares the drinks and brings them back to the passengers. Thus, there is no need for passengers to go to the bar. 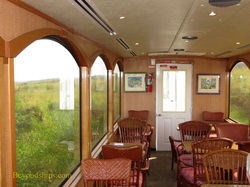 When we were aboard, the staff was generous with the drinks, coming around several times to take orders. As it was early in the day, most passengers declined a refill after the first round. One passenger in another car took full advantage and since he was sitting upstairs, the entire train was treated to his thoughts on various topics. Much more interesting was the commentary coming through the public address system. The narrator gave us the history of the train and explained the points of interest that we were passing. She also pointed out monkeys and other wildlife visible from the train. From time to time, the narration was interupted so that the St. Kitts R choir could sing a song over the public address system. The three young singers then went around to each car and performed in person. We passed through fields of sugar cane and other crops. Past ruins of old suagr mills and past still active 19th century churches we went. Passing through towns and villages, children ran out to wave at the train and seemed pleased when the passengers waved back. We rolled on over tressels and bridges spanning deep gorges with lush vegetation. Off to one side throughout the trip, the dormant volcanos and mountains that occupy the center of St. Kitts took on different colors in the changing sunlight. On the other side was the sea, sometimes with distant islands, sometimes with waves crashing against black sand or a rocky shore. Quite pretty on a sunny day sprinkled with large puffy clouds. Above: The train at the northern end of the line. Below: One of the carriages. Above: The lower level of a carriage. Above: The southern terminus of the line. Towards the end of the trip, the scenery became more industrialized. The passengers seemed somewhat anxious to get to the destination. It had been nearly two hours aboard the train. Soon the train pulled into a small station that is the train's home base. As at the other end, the track looped back on itself so that the train could turn around and be in positionn tomake its next journey in the other direction. Here, the van that had brought us to the train was discharging another set of passengers who climbed abosrd the train for the next trip. When they departed, we took the seats that we had occupied earlier. Ten minutes later, we were back at the cruise terminal. Overall, it was a relaxing experience and the staff worked hard to please. The slideshow below shows some of the scenery the train passes through.